Archaeologists from the University of Southampton are set to demonstrate shipbuilding skills from the days of Britain’s most famous Royal Navy flag officer, Vice Admiral Horatio Nelson. 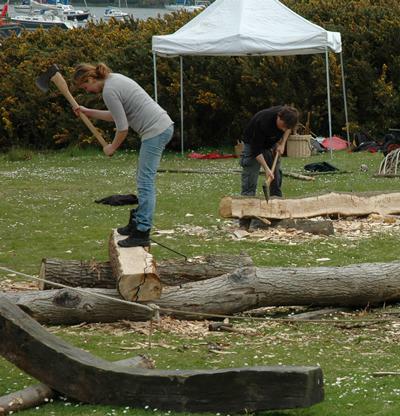 The staff and students will get hands-on experience of using tools and applying techniques from the 18th and 19th century as part of a weekend (2 – 4 May) of activities at Buckler’s Hard, near Southampton. The students will share their work with visitors who can watch as they convert oak timbers from the Beaulieu Estate into the main components of the framework of a ship – discovering the challenges faced by craftsmen of the time, and working out how they overcame them. The weekend will also be an opportunity to see the recently completed Shipwright School, which the University has helped to develop and where courses teaching traditional shipbuilding will soon be underway. Archaeologists at the University have a long established connection with Buckler’s Hard through the Beaulieu River Project – an investigation of the archaeology, history and geomorphology of the Beaulieu River. People can learn more about Maritime Archaeology by studying, for free, the University of Southampton Massive Open Online Course (MOOC) ‘Shipwrecks and Submerged Worlds: Maritime Archaeology’.